Arco-Íris (Leiria, Portugal) on 24 August 2008 in Lifestyle & Culture and Portfolio. Soberba imagem, contraste e as cores maravilhosa, eu realmente gosto de verde como moldura. Nice framing, love the green door too! I like the composition, very cool. Great colours too. 'Cobbler' in English I think:-) What a great composition here, great framing and super colours...superb! We have places like this in Iran, too. Cool! I was for a moment on your site. Avery nice site! I come from Fryslan, alias a part of Holland. I invite you to visit my site too. @nanne: Thanks very much nanne. Gosto desta foto como documento. Faz-me lembrar as nossas lojas de bairro ou de vila. Há que fotografar as nossas enquanto não desaparecem ou ficam todas iguais às dos centros comerciais. Quando digo que gosto da foto como documento não significa que não seja uma boa foto. As cores parecem-me bem e a exposição perfeita. 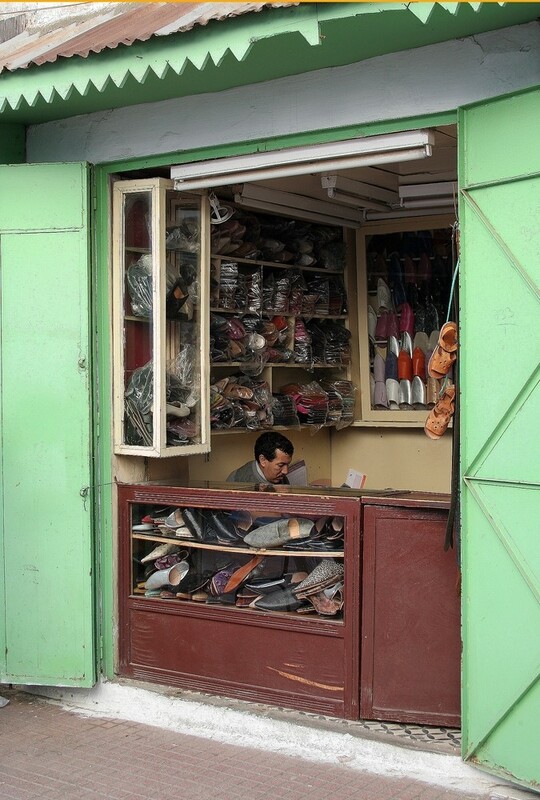 A nice composition of a shoemaker busily at work. Your detail is excellent. @Michael Skorulski: Hi Michael, Thanks for your visit and comment. beautiful color and detail! wonderful framing! Wonderful colors! I love the detail of the broken design on the roofline. A fine shot of this vendors place of business. I like the way his store is packed with product to sell. Love the green colors..and how you've framed this image. Nice! The world is indeed small....we have same kind of shops in our home town...lovely! Very cool shot and he has a massive amount of shoes. great colors and very clean and crisp image. Preciosa imagen de esta modesta tienda de babuchas y calzado. Bien vista. A nice shoe shop. I like these street scenes a lot. nice street shot, like these little shops. Excellent colours and composition... very interesting... seems more upmarket to Kabul! Gostei imenso desta foto, pelas cores, pela tipicidade, por todo o ambiente. Gostei muito. É das minha preferidas. Very little shop. It is nice to see that the little commerce isn't killed by the supermarkets. Ah, this brings back memories of my growing up in Peru. We had zapaterias like this. Nice shot! What an excellent capture...a moment in life. The colours and details of his shop are wonderful. great street candid shot. seems like such a tiny storefront, and the display case looks more like it's being used as storage space. So authentic ! Nice !!! You have a special way of capturing people. I like it a lot!